The best way into the restaurant is through the barrier-free entrance from the mall which is kept open during mall hours and measures 47” wide. After-hours (part of this restaurant is also a pub), the only other way into the restaurant is from the outside which has a step without a ramp. There are automatic door openers at all the major mall entrances as well as The Bay, Shoppers, and Metro entrances (all 35” wide). Upon entering from the food court, you will be welcomed by a variety of booth and bar seating options. At the back of the restaurant there are several standard height tables measuring 29” high. Reservations are welcome so consider to do so on a busy Saturday morning for one of these tables! There is adequate turning and passing space around most of the booths and tables. 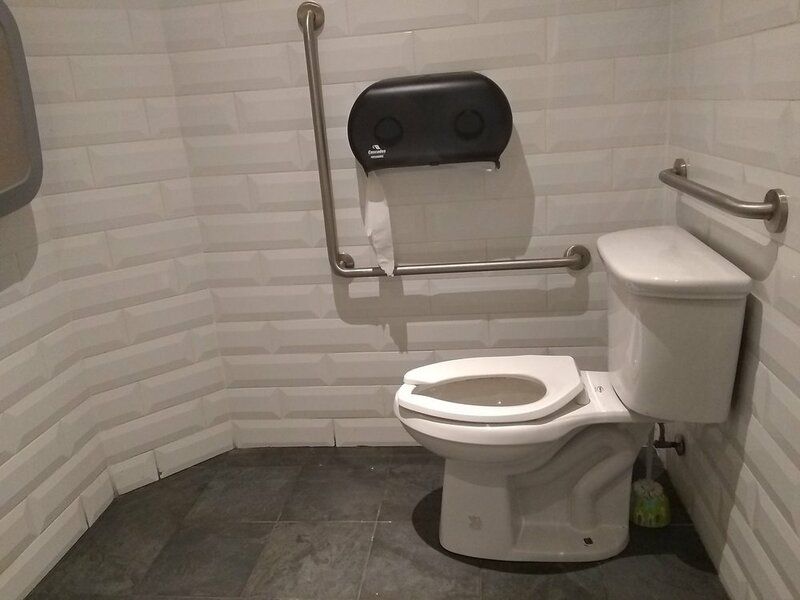 While there are no large stalls in the regular washrooms, the restaurant does have a single room accessible washroom. The 35” wide door is currently partially obstructed by a coat rack, however, with slow and careful maneuvering, my wheelchair was able to get in. Inside, the space measures 70” x 113” with lots of turning radius, two grab bars around the toilet (an “L”-shaped bar beside and straight one behind), a floating sink, levered door handle, infant change table, automatic hand dryer, and a tilted mirror. The mall takes up the entire block between Victoria Park and Pharmacy, and is serviced by 3 accessible major bus routes (#34 Eglinton East, #24 Victoria Park, and #67 Pharmacy), Victoria Park subway station (which has elevators and escalators), plus WheelTrans. This restaurant is an excellent alternative to the mall’s food court, where you can eat good food, you won’t be pushed to finish your meal, and on certain nights there’s live entertainment or karaoke. Service animals are welcome.